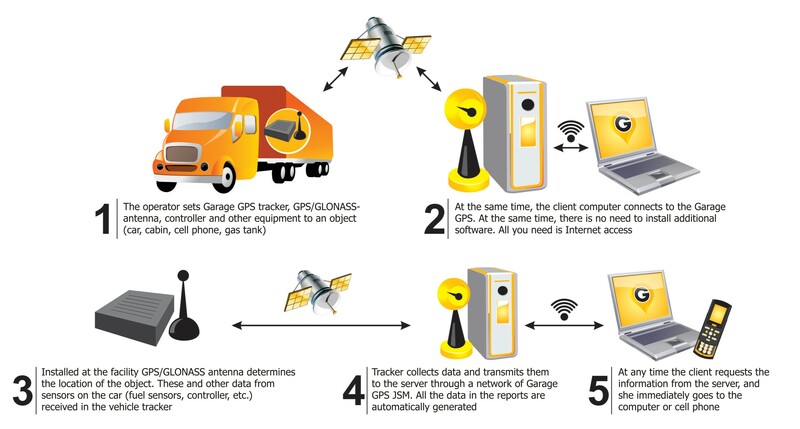 Transportation satellite monitoring system not only gives the opportunity to get information about location and condition of movable objects in a quick manner but also it helps to effectively minimize costs of companies that use transportation monitoring system GLONASS/GPS. Abbreviation GLONASS stands for "Global Navigation Satellite System". Together with GPS it is one of two world systems of satellite navigation functioning today. Same as GPS, it helps to identify exact coordinates and speed of moving objects. Abbreviation GPS stands for Global Positioning System. At present it is the most popular technology in the field of satellite navigation. It helps to identify location and speed of moving objects with high degree of accuracy at any time of the day or night and at any weather conditions. Any person can connect to GPS system - he or she just need to buy GPS-receiver so-called tracker. What is transportation satellite monitoring? It is a system of detailed tracking and control of ground, water and air means of transportation based on satellite navigation systems GPS and GLONASS. What tasks does satellite monitoring solve? Control of fuel and temperature probes, odometer, and other probes. Identification of non-used fuel or its discharge, downtime data, time of engine start/cut-off. Identification of technical faults in different part of a vehicle, machinery and equipment.